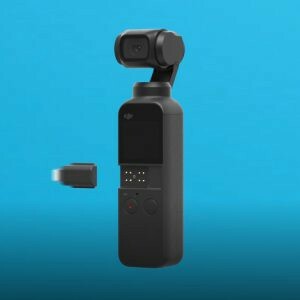 With what looks to be a focus towards a younger demographic, vloggers and YouTubers, DJI has just announced the latest (and smallest) member of their Osmo handheld camera family, the aptly named Osmo Pocket. Measuring a minuscule 4-inches tall, the Osmo Pocket is small enough to do what the name implies, comfortably fit in your pocket. But don’t let it’s diminutive stature fool you, the “Pocket” boasts a 1/2.3-inch sensor (the same as found in the Mavic Pro, Mavic Air and Mavic 2 Zoom drones) that is capable of capturing 12-megapixel photos and 4K videos at up to 60fps at 100Mbps. The camera is built into a tiny, state-of-the-art 3-axis mechanical gimbal that adjusts for movement in real-time giving you silky smooth video and sharper images. On the back of the body is a 1-inch touchscreen that provides live view as well as the interface for adjusting shooting modes and camera settings or reviewing already captured footage. If you don’t want to use the built-in touchscreen, you can attach your smartphone to the Pocket via an included USB-C or Lighting adapter that attaches via the universal port located just below the touchscreen on the body of the unit. Side note: This method of attaching a smart device makes us pause a little (the DXO One camera had a similar connection method and with a phone attached we had issues with it not staying solidly attached to the camera), but we will have to wait and see how it feels when we have a unit in our hands. Of course, if you don’t want to attach your smart device to the unit itself, you can sync over a wireless connection using a wireless module (sold separately) that attaches to the bottom of the Pocket and allows you to view and edit footage on the fly and control the camera via the upcoming DJI Mimo app. The software also includes DJI’s familiar ActiveTrack feature, which on other Osmo models, trains the lens on your smart device to follow a subject. However, with the Osmo pocket, this feature works directly with the built-in camera rather than the smart device. There is also a new feature called FaceTrack which allows the camera to identify a human face and lock it in the frame even if the person starts to move out of frame or looks up and down. Other features include: ProMode which automatically senses low light scenes allowing your to adjust exposure settings and story mode (think GoPro’s QuickStories) that will stitch together several short video clips to create a longer video. Rounding out the features there are multiple panorama options as well as Timelapse and Motionlapse modes. As shown above, DJI plans a host of accessories that provide greater flexibility when using the Pocket. These include a waterproof case allowing you to take your Pocket underwater up to a depth of 60m (approx. 200ft), the already mentioned wireless module, ND filters and a control wheel that attaches via the universal port and allows for greater one handed control. For those who want to use the Pocket as an action cam, there is a Quick-Release Base that attaches to the Accessory Mount with an industrial adhesive strip which allows you to mount the camera to a helmet, board, and other surfaces. Finally, there is also an expandable length, gimbal control stick with operation buttons on the handle, a folding mount for your smart device and 1/4" tripod mount on the bottom. Originally published at Vistek ProPhotoBlog.